The winter holidays are around the corner, with time split between two of my favorite things: family and shopping. The pressure to find “just the right gift” can change shopping for the worse, causing people to shop impulsively and not look for the right deal. When it comes to consumer electronics, prices may look great on “Black Friday” but waiting for the price drops of early December may be an even better deal. So what is a bargain hunting consumer to do? I am excited to be partnering with Decide.com, a company that empowers consumers to make smart electronic decisions with a 60 terabyte historical pricing database, 8 billion price observations and growing. 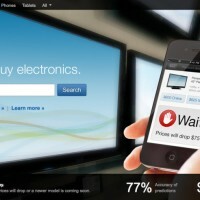 Decide.com’s shopping service predicts when to buy consumer electronics with no regrets by providing information such as price comparison, average release cycle, last release, device’s age, average rating and product details. Their just announced Decide.com mobile app for iPhone and iPod touch will enable consumers to have the power of prediction in the palm of their hands while shopping. Here are my no regrets shopping tips to make sure consumers are armed with the right information to make the best decisions. Don’t be a sale chaser – while it’s true that a few select products go on sale in the wee hours of the morning, you’ll likely regret rushing out to fight the crowds at 5am only to discover there were only 5 TVs available at that price. Spending hours chasing down a special holiday deal can be a big cause of buyer’s remorse. Do your homework and find the real holiday sales. Stock up and save on electronics for the family – wait for the holiday season to upgrade on the latest gadgets and electronics for her family. For practical and smart gift giving, holiday is a great time to stock up on those items that your family needs – a family computer, TV, other devices for family – and save big. Don’t be fooled – buying an older product model at a fire sale price is not necessarily cheaper. For example, by doing a search on cameras I realized that some of the newer models have better pricing then the models they replaced. Arm yourself at the moment of purchase: With Decide’s new prediction app for iPhone, when you’re shopping in the store this holiday, you can know if that product is a deal or not by simply scanning the barcode for an instant prediction. You don’t need to give up on finding a deal even if you are making a spontaneous purchase (like we all do). Disclosure: This post is in partnership with Decide.com. Win a $5K Shopping Spree Contest: Download and install the Decide.com App for iPhone and iPod touch for your chance to win an American Express gift card for $5,000. Contest ends December 25th, 2011. More information on the contest can be found on the Decide.com blog.